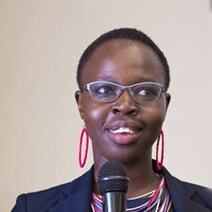 Sophie Otiende describes herself as a feminist, teacher, and survivor advocate for human trafficking. She has worked with grassroots organizations for the last decade, primarily in program development, management, and fundraising. She is dedicated to women’s empowerment initiatives and growing grassroots organizations to develop programs that influence policy change. She developed curriculum to train women on entrepreneurship and recently co-authored a manual on child trafficking. She is currently a program consultant for HAART Kenya and coordinates their victim’s assistance program as well as their fundraising efforts. Her background is in education, majoring specifically in business. Sophie is a Vital Voices Fellow.